I had a super visit in Tennessee. It’s different in a lot of ways from Washington, but I think both states are very nice. The town I went to was a really small one. It has fewer than 450 people! 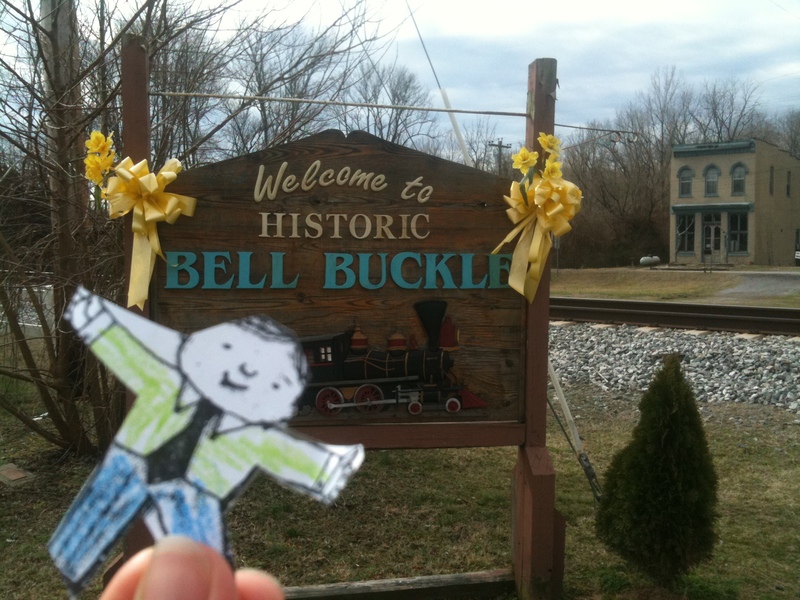 Here is a picture of me by the town sign, next to the railroad tracks. 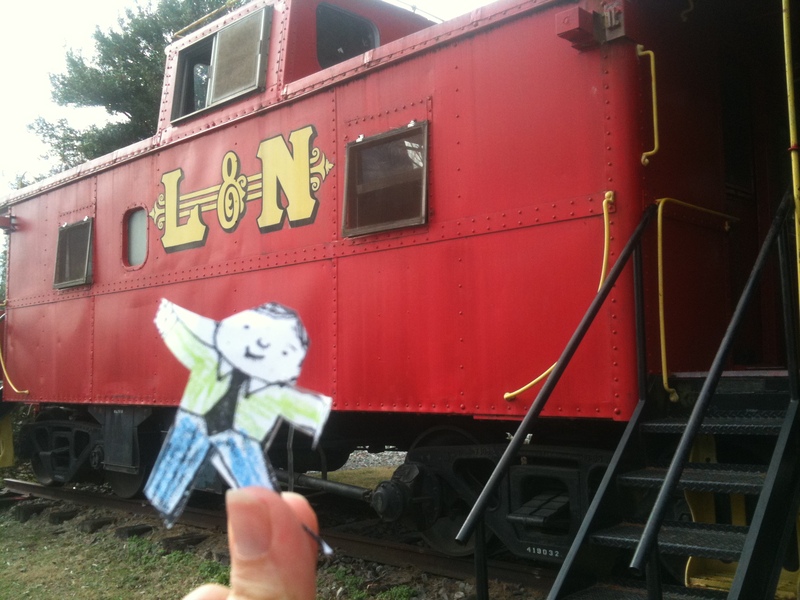 They even have an old-timey red caboose that kids can climb on! I went to the downtown square. They have shops with old furniture and other weird old things, handmade jewelry and artwork, a restaurant, and an ice cream store. 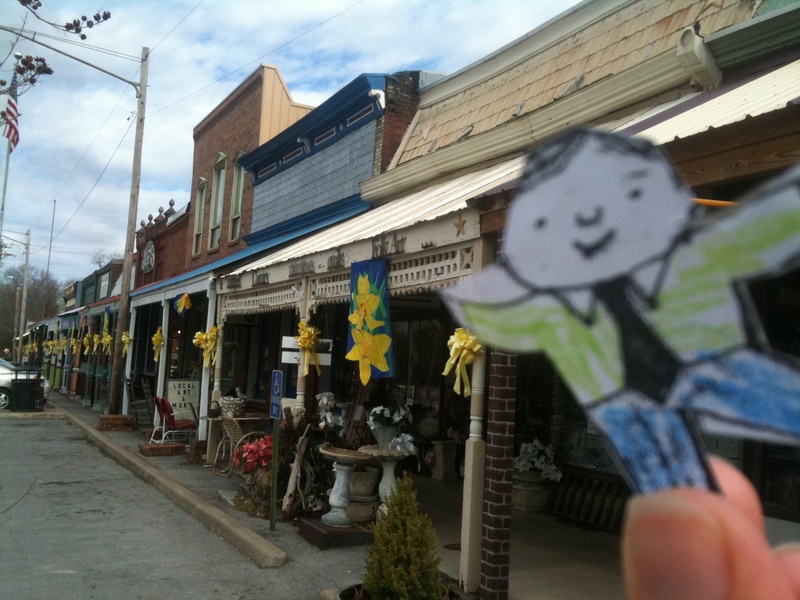 The town is getting ready for Daffodil Day, so they had a lot of yellow ribbons everywhere. 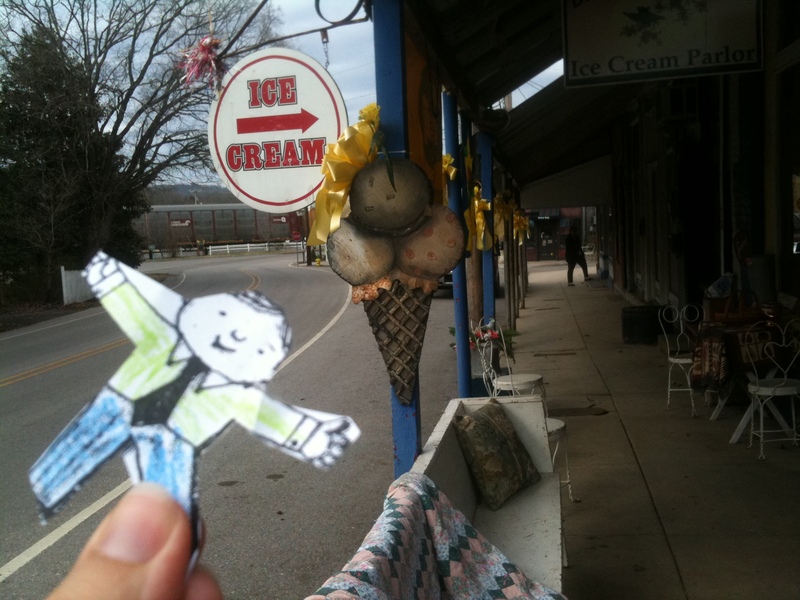 This town has lots of special events like a Wheelchair Basketball tournament, RC/Moon Pie day, a Quilt Show, a big Art and Craft Festival, and an Old Fashioned Christmas. Lots of people in town don’t even have mailboxes. 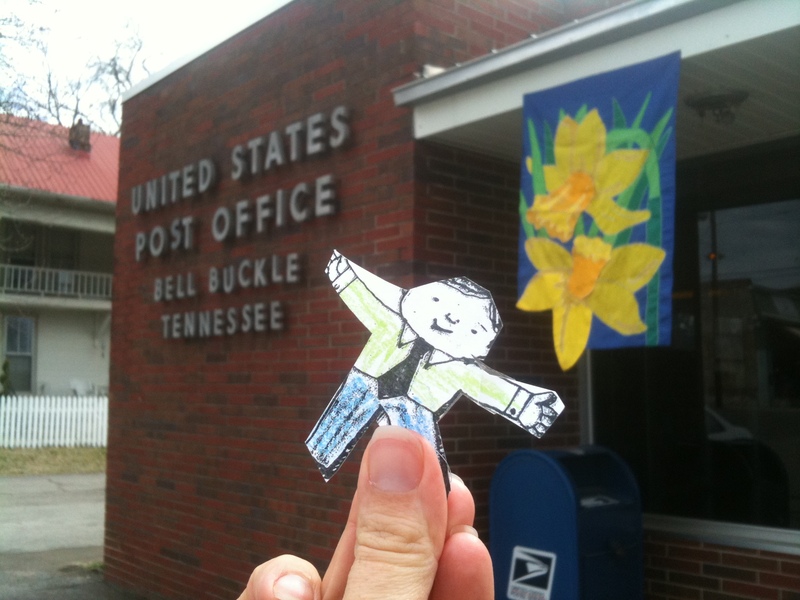 They like to go to the town Post Office to get their mail because they get to say hello to Mr. Bill and Miss Bonnie. They also like to see the newest information from their neighbors on the town bulletin board. 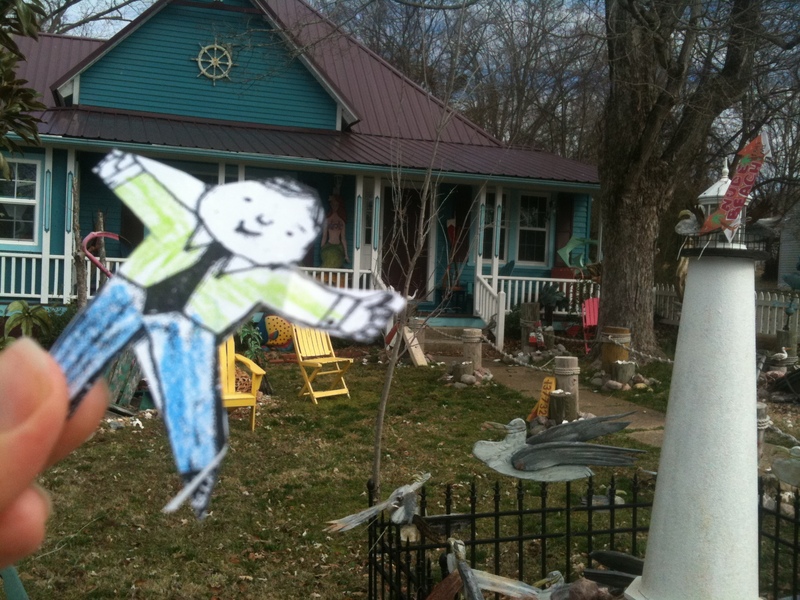 I saw some cool old houses with some colorful and fun artwork in the yards. This one was my favorite. It belongs to a famous poet named Maggi Vaughn. She is the Poet Laureate of Tennessee, which means that she is very loved and admired here for her poetry books. Can you guess what her favorite colors are? Next I visited the town park and playground. 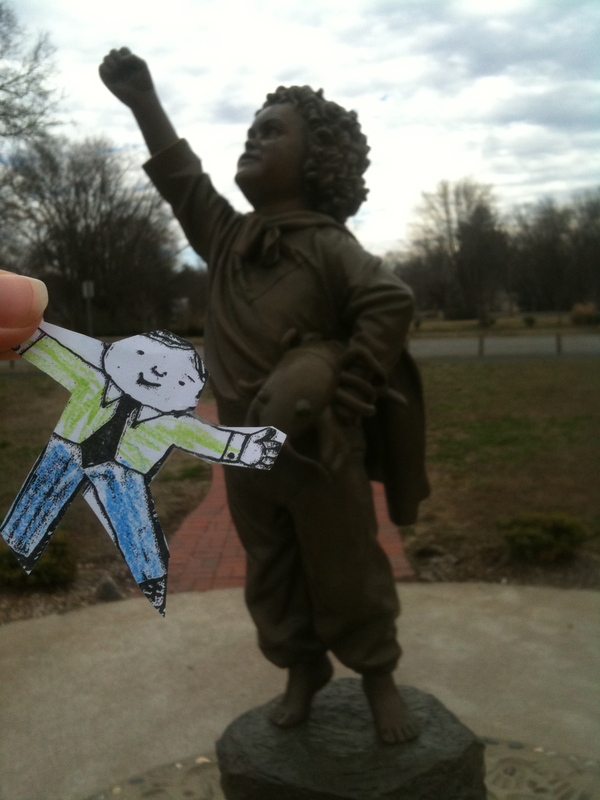 Here I am in front of a statue of Ward, your cousin. Cool statue, huh? 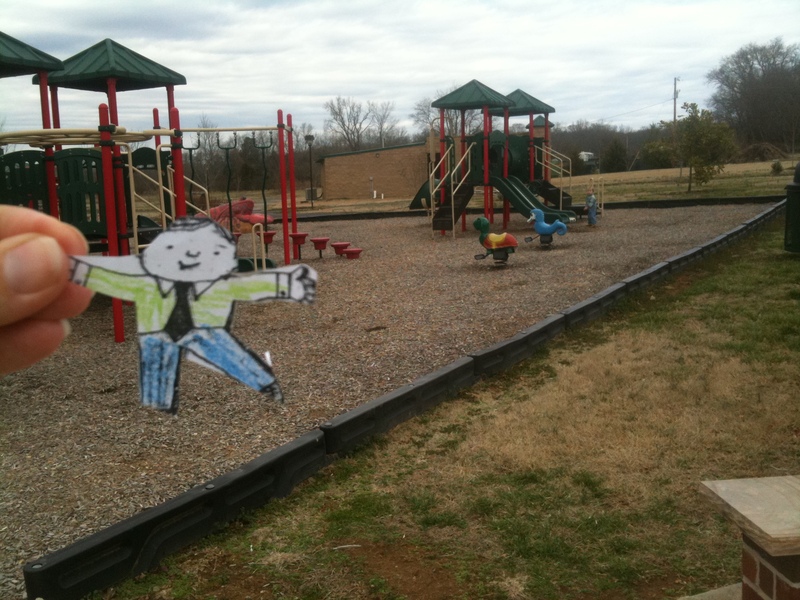 I had a really fun time playing at the playground, too. Playgrounds are the best! You have some fun ones near your house, too. Thanks for sending me to Tennessee. I’m on my way home to you now. I’ll see you soon! This sort of reminds me of Anne Geddes’s stuff, except it’s more tender, I guess because of the sleeping baby. And I absolutely love the crafty, home-madeness of the tableaux. It’s just incredibly sweet and so well done. Ball preparation has been a wild flurry of activity for the last few days. It takes A LOT of work from the committee to put this thing on. Money, food, alcohol, the band, auction donations, correspondence, decorations… But, oh, goodness, the ballroom in indeed gorgeous. It’s a confection of pink and black, and yes, the feather boas are used to great effect. Feathers on the tables, lit balloon bouquets are going in place today around the room. Feather Sparkle Barbie and Pink Tie Ken tonight = Awesome. One of the ladies commented that Yes, indeed, that’s one girly bar, but that the men will get over it because they can still get their drinks from it just fine. Part of my job is writing up the bid sheets, so I’ve been putting in some major computer time to get those done. We put baskets together on Tuesday, and some of the ladies started decorating on Thursday. Friday was decorating day #2; I had to take all the boys and let the big boys chase Rainbow around. Then left to put him down and work at home, while many ladies remained to work and work throughout the afternoon. We’re meeting again this morning, and should, at that point, be ready. I gave up on getting my dress altered. I know. It makes me sad. But the neighborhood lady who normally alters for me (who comes to my house to pin me) has been sick, and I have been so dang busy that it’s just incomprehensible to work out babysitting to drive somewhere to get my dress altered. And taking Rainbow along on a fancy dress altering excursion is just totally out of the question. But! My friend and committee co-chair J came through. I’m borrowing an amazing dress from her. It’s chocolatey-caramelly-brown, with sequins and beads and an open back. Yes, it won’t match our pink and black theme, but whatever. It’s fun to wear something new and beautiful, and I love it. 4. get my nails done. A French manicure, maybe? Two of my friends did a “gel” manicure and it looked lovely. I’m calling it Early Spring. Largely because I am sick to death of bitterly cold weather that makes it miserable to go on walks or play outside. 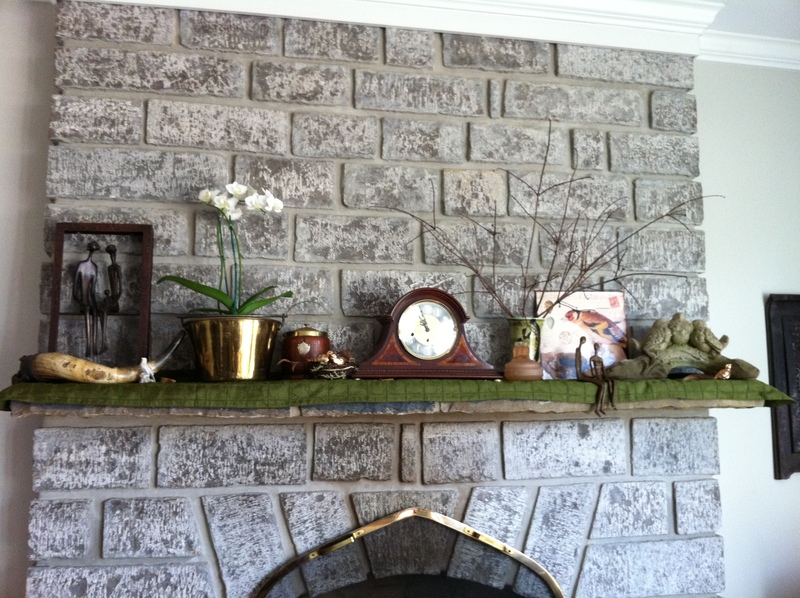 Which means it’s time for a new mantel display! 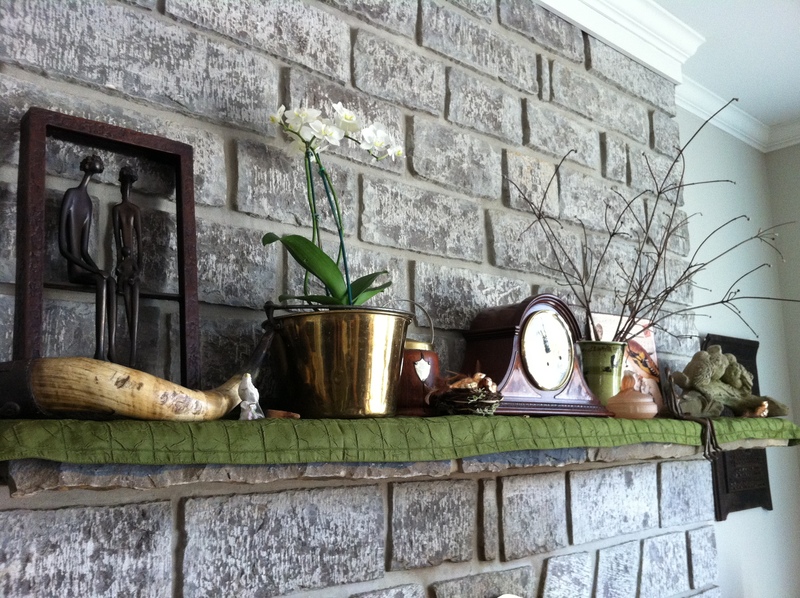 I love decorating the mantel. I had some pitiful remnants of the Christmas mantel up until now (a champagne lame’ scarf and red votive holders were all that was left after all the CHRISTMAS!! 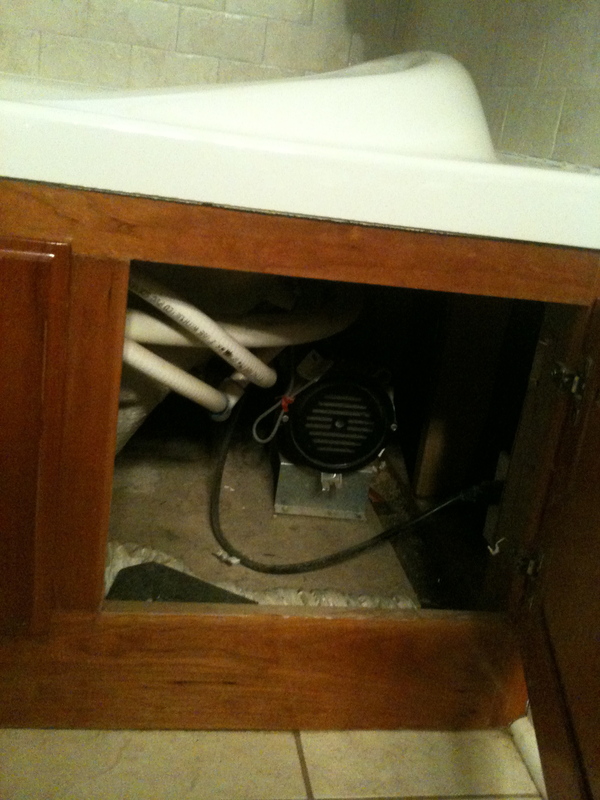 stuff was removed) and just now busted a move. Birdy! Mossy! Might-Bloom-Dogwood Twiggy! With some gold and peachy tints thrown in. I got inspired because we’re having our yearly Superbowl party this evening and wanted it to look nice, not like the mantel of a home where people, like, leave up their Christmas decorations til February. 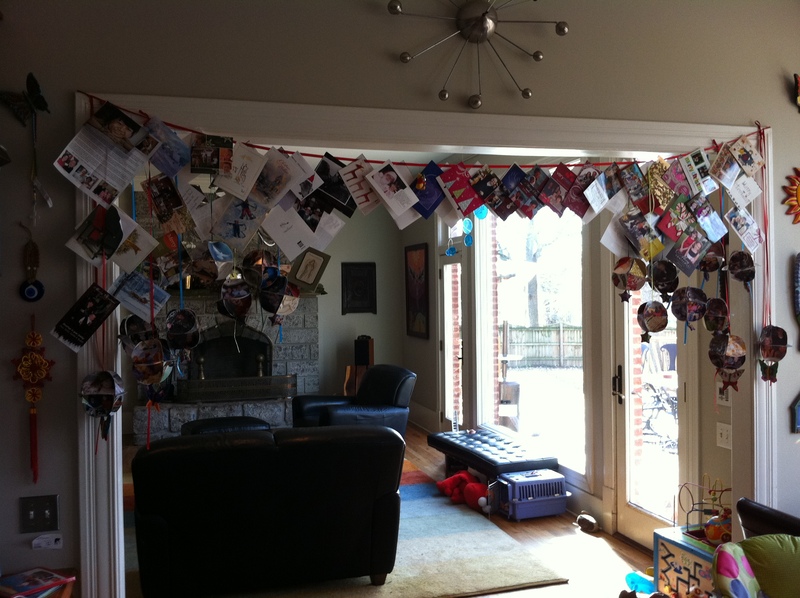 Which I suppose also means that it’s time to take down the Christmas cards. I’m sort of procrastinating that one until after I eat lunch and do a little work this afternoon, and won’t really be that heartbroken if they end up staying up. If not my very favorite thing, having Christmas cards up on display is totally in my top five Things I Love About Christmas. I know it’s time to pack them away, but I do love them so. At one point I sort of ha-haaaa-ed that I sure hoped it wasn’t Flesh Eating Bacteria, because that sure would be lousy. Like, if my rear end was being eaten away. HA HAAAA!! And then totally had to look up the symptoms of Flesh Eating Bacteria attacks. NO, I wasn’t dumb enough to google it this time, but I was dismayed that Wikipedia had a horrifying image right up there on the top of its entry. Don’t they know they need to be more sensitive to hypochondriacs??? I’m kind of chasing my tail lately, what with the ball planning and the novel writing and the article submissions and test passage writing. Kinda crazy-busy when I’m not doing my momming duties. I did take Rainbow to class at the children’s museum today, and we did have to leave and hang out in the foyer for the last half of class. Apparently it’s impossible for him to sit through class just knowing that the fun stuff in the museum is right outside the door. We had fun after, though, and friend B brought her little man there (he was another Kindermusik hopeful a couple of weeks ago) so that was good. We’re trying time-outs (Mac inspired me) and Rainbow doesn’t really get it yet. At all. It just baffles him. He’s all, Twucks? Twucks, pweeze? Down? Down, PWEEZE? But we’re trying… I am thinking that once he learns what a time-out is, and I have something to threaten him with, I’ll make some real headway with discipline around here. Another piece that I wrote just went live on Like Totally 80’s. It’s about my experience with aerobics at a health club when I was a teenager. Yesterday was kind of a stir-crazy day for Rainbow and me. I thought staying inside on a cold, wet day would be cozy, but it was actually kind of claustrophobic. Rainbow got punchy by the end of the day, and I resolved to get out of the stinkin’ house today and do something. Aha! I’ll take Rainbow to the playzone in the mall! He LOVES that! AND, while I’m at it, I’ll swing by TJ Maxx and get some dress shoes and a backless bra for the ball! It’ll be GREAT! And, yeah. No. It wasn’t. TJ Maxx was reasonably successful. I did find some dress shoes that fit and I bought them. They’re pretty cute. A little more practical than I was hoping for, but the only sassy ones they had were platform stilettos, and I thought that was ill-advised for a dancing event. 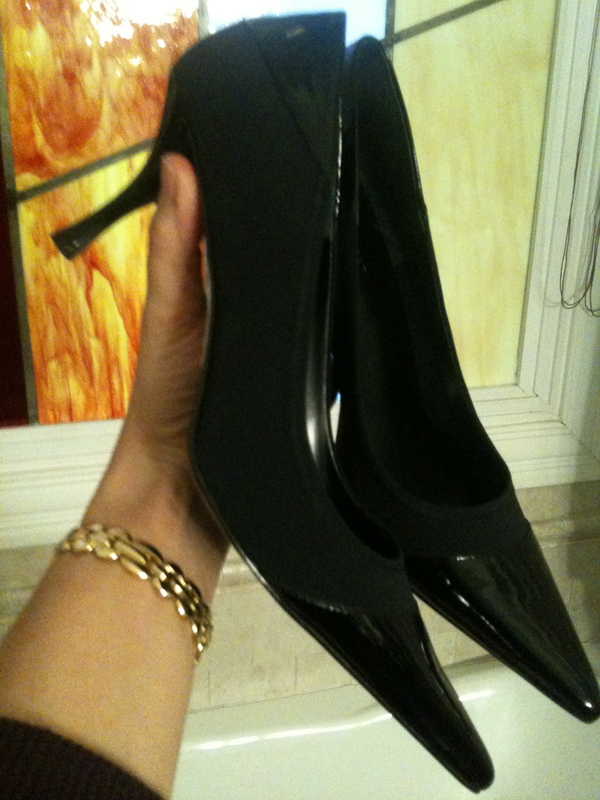 And I don’t have any cute black dressy pumps, so these will be nice to have. TJ’s didn’t have any backless bras (!!) and I should have just called it a day, but decided to breeze into Dillard’s with Rainbow (who had been fairly content at TJ’s) and check there. I put him in the umbrella stroller and would have none of it. He just wouldn’t sit down or stop crying, and kept begging to get out. He was happy to get out, but wanted to run all over the store. Didn’t want to hold hands, and then had a total meltdown when I carried him. It was a bad scene. Like, almost funny, sort of. In a very dark way. Lots of me standing over him with hands on hips and just watching him writhe on the floor. Trying to reason with him – what is the problem here? do you understand you’re not making either of us feel good by screaming? – which was really dumb. Since we were already there (dammit!!) I carried him under one arm and went to the lingerie department*. I’d put him down briefly and he’d sort of stay with me, then get a stinker-grin and make a break for it. A cycle of pick-up and carry, cry piteously, be released, then run off with a sniffly little smile. I had the lady show me her favorite backless bra and paid for it without trying it on. Of course it doesn’t fit. Either the sizes have changed since the last time I bought a backless bra, in college, or I’m not the same size I was when I was twenty. Obviously, they are sizing backless bras differently now. The lady did say I could return it, so good. Also, I noted on the way to the toddler playzone that there’s a Victoria’s Secret in the mall that I’d totally forgotten about. Which surely will have the undergarment I need. Which I will definitely purchase without a quickly bored, tantrum prone, nap-resistant little man in tow. * You would be surprised how hard it’s been to find a backless bra in my neck of the woods. This was literally the fourth store I’d tried (Walmart, Peebles, and TJ’s being the first three) and it’s hard for me to get out and shop, so I was determined to leave with my quarry.